When I’m Gone by Angela K Couch is set in 1942 America. It’s a sweet story set over the two and a half weeks before James has to leave for the draft. The reader can really empathise with James dancing partner Lainy as she goes through conflicting emotions. Through it all God is faithful. Dancing In The Rain by Marion Ueckermann is a wonderful story set in South Africa about the preparations for Noah and Mirabelle’s wedding. The reader can sense their excitement and shares their fears. Superstitions needs to be released and replaced by trusting in the God of the universe that all will be well. Dancing Hands by Derinda Babcock is a beautiful love story. Toby is deaf and is shunned by people who gossip about him. Morgan sees his pain and befriends him. Morgan has pain in her life too. The reader experiences a little bit of life from the point of view of a deaf person. It is wondrous to see that our great God does not need to be worshipped with voices. He can be worshipped with hands. Teething Problems by Elizabeth Pina is a tale around those first difficult months of having a baby. It is easy to empathise with the tiredness, hard work, lack of time and the total love that a baby brings. Love, prayer and good friends are what gets you through. Fred And Ginger by Steve Hooley is written in the first person from the viewpoint of seventy five year old Fred. It is a touching tale of a man trying to move on in his grief. Fred’s life ground to a halt two years earlier when his wife Jenn died. Now it’s time to be brave and try to live again. The Last Waltz by Toby Quirk is set in the 1960’s at West Point, with the backdrop of the Vietnam war. The story reminds the reader that life is more than what we can see. It is a spiritual battle against the forces of evil. In order to stand firm and fight the powers of darkness, one must be immersed in God’s word. Only then will one be able to distinguish good and evil. The Confession by Kathrese McKee is set in 2215 and written in the first person of Christine from her prison cell. Her captors want her to relinquish her faith. She needs to hold on to the word of God. Night Dance by Gretchen E K Engel is a fantasy tale. There is the theme of searching for ones identity. The Dance Of The Light Brigade by Steve Hooley is another story set in the future with a battle taking place in space. 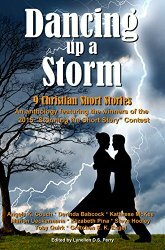 I really enjoyed reading the short stories in Dancing Up A Storm. It is a long time since I dipped into short stories. They were all excellent. My favourites were the first six, as I am not into futuristic genres as I often get confused. I can highly recommend reading them all.